Thousands of years ago, Crete was the cradle of western civilisation. Numerous archaeological finds have taught historians that ancient Crete was already the homeland of the olive tree, and in their exciting quotations, its golden product olive oil comes to life. The tree and its fruit were considered sacred, and were seen as symbols of knowledge and wisdom, of prosperity and peace, of health, power and beauty. They were worshipped for many centuries and formed the basis for the creation of traditions and myths. In the Middle Ages, the Venetians became the rulers of Crete. 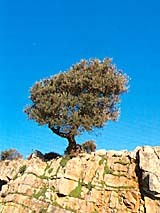 They valued its olive oil so highly, that they strongly encouraged the planting of trees. In our time, almost eight hundred years later, olive oil from Crete is still highly in demand by Italians, who are known to appreciate excellent quality and taste. First of all, there is the excellent soil combined with the superb climate which yield a very high quality, consistent product, more than any other region in and outside Greece. Secondly, there is the tradition where knowledge is transferred from generation to generation, and finally the use of modern technology which has helped in further improvement of the quality in the last few decades.